The circulatory system of an unborn infant, or fetus, functions quite differently from that of a baby after birth. The most significant difference is that, while a baby after birth acquires life-giving oxygen from its lungs, a fetus receives oxygen from its mother through the placenta. Oxygenated blood travels from the placenta to the fetus's heart by way of the umbilical vein. 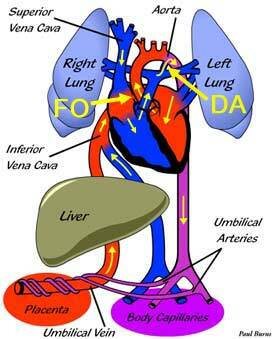 The heart structure of the fetus differs from the normal postnatal heart in that there is an opening in the atrial septum called the foramen ovale (FO in diagram). This allows most of the blood that enters the right atrium to flow into the left atrium instead of into the right ventricle. From the left atrium, the oxygenated blood is pumped into the left ventricle and into the aorta, which carries blood with the highest oxygen content to the brain, whereas blood to the lower body tissues (with a lower oxygen saturation is supplied by the ductus arteriosus (see below). From there it returns to the placenta via the umbilical arteries. The second feature of the fetal heart that differs from the postnatal heart is the presence of the ductus arteriosus (DA in diagram). This vessel connects the pulmonary artery to the aorta and allows blood to flow from the pulmonary artery into the aorta, which carries it to the placenta for oxygenation. The ductus arteriosus normally closes soon after birth (triggered by breathing) and blood in the pulmonary artery goes to the lungs for oxygenation. The lungs in a fetus are non-functional and filled with fluid. The presence of this fluid makes the lungs resistant to the flow of blood into them and therefore receive only a small fraction of the fetal cardiac output.